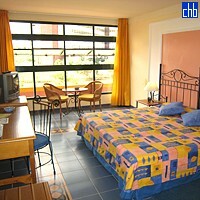 Montehabana Hotel is brand new, and currently exceptional value for money. Except for the very low price we don't know why it is only categorised as only 3 stars. At this hotel you can get a whole apartment, and a lot more besides, for less than you normally pay for a small room elsewhere. But what really makes this hotel a wonderful place to stay is the quality of the staff at all levels. 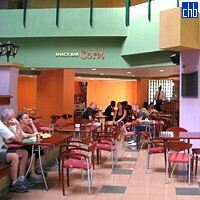 We at Cubaism Ltd have never experienced such professionalism and sincere kindness in any other establishment in Cuba. The Starfish Montehabana is located in Miramar, the poshest neighbourhood in all Havana. It overlooks one of Havana's biggest grass parks, it is very near the seafront, Miramar Trade Centre, most of the embassies, and some of the best shops. Starfish Montehabana was built in a wooded terrain of the XVIII century, well-known as Monte Barreto that defines the warm, natural and calm atmosphere. 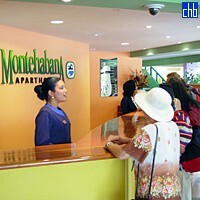 The Montehabana apartments with well-equiped kitchen-dinning-living rooms suits both long-staying guests and conventional tourists. The convenience of being able to prepare your own food and drinks when you like makes you feel like its your home and not a helpless hotel guest. 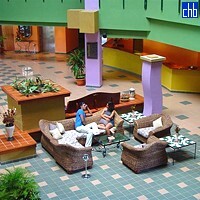 Aparthotel Montehabana has the best communications setup of any hotel we know of in Cuba. There are 2 hotel PCs with internet. Your laptop can be connected via fast (for Cuba) WiFi throughout the large main lobby, cafe, bar, and on each floor by the lifts. Also, nearly all apartments and rooms can have internet by ethernet cable via (a PLC modem connected to) any power socket. If you buy a 100 hour internet card you get access for 2.50 CUC an hour. 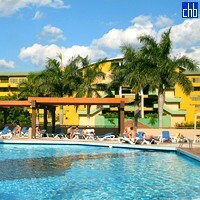 We don't know of any other hotel in Cuba with internet this cheap. The modern hotel telephone exchange allows for dial-up connections too, and the phones in the rooms even have a modem port. The Starfish Montehabana 24 hour snack bar is starting to get a reputation by the Cuban locals for serving the best hamburgers and fries in the area; and at just 2.50 CUC they are cheap too. Most evenings a live band plays well-known Cuban music. Since it is the only 24 hour snack bar in the district, at the weekends the bar has quite a buzz of young affluent Cubans coming from nearby nightclubs. Not many hotel bars in Havana can boast such pulling power of the local people. Aparthotel Montehabana has a free basement car park with lift/elevator direct to your floor which is both convenient and secure. There is an ice maker machine on each floor and very well run laundry service. The major currencies can be exchanged for local currency (CUC) or withdrawn using Visa or Mastercard at the Cadeca near the lobby until 8pm. The on-site grocery store is currently rather disappointing. Most frustratingly it does not have fresh bread, fruit or vegatables. Nearby you can discover most essentials if you have keen hunter-gatherer skills. 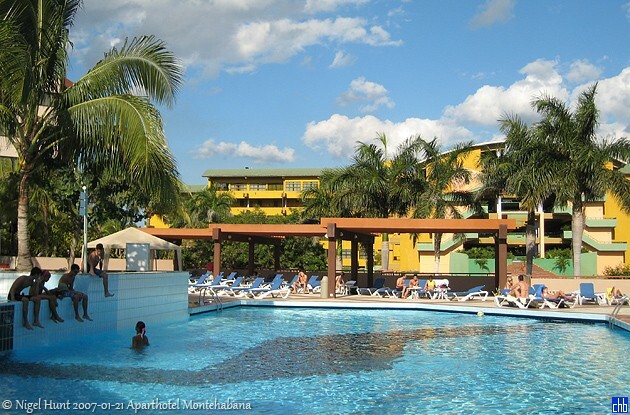 Since Cuba is generally very hot and sunny I guess you will be glad to learn that Montehabana guests can make free use of the neighbouring Memories Miramar Hotel luxury 4 star swimming pools. 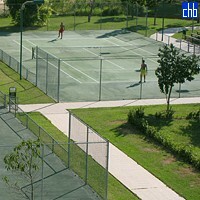 Available too is use of their "Best in Cuba" well maintained international-standard tennis courts. At the time of writing this review I am unclear whether or not it is necessary and where to pay for use of the courts. Usually only 1 out of the 6 tennis courts is in use at any one time. Although we strongly recommend the freedom and fun of hiring a car in a capital city with relatively no traffic, taxis are cheap, and guests can catch a shuttle bus with several daily departures toward the city centre for 5 CUC. 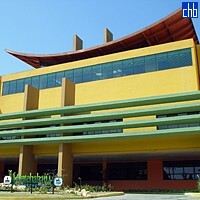 Aparthotel Starfish Montehabana was previously known as Memories Mentehabana and Occidental Montehabana. 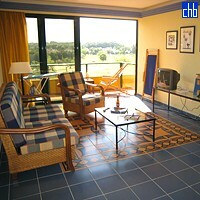 Standard rooms (76) are modern, comfortable, large, clean and in very good order. They are cleverly orientated so they can be combined with a one bedroom apartment via a common hallway, to make a two bedroom apartment.